Blackbeard, who is almost certainly history’s most infamous pirate, is a figure shrouded in myths and wild rumors. Now archaeological excavations into his sunken flagship is revealing that the historical Blackbeard was far scarier than any legend ever could be. We’re fairly sure that Blackbeard was born either Edward Teach or Edward Thatch in Bristol around 1680. 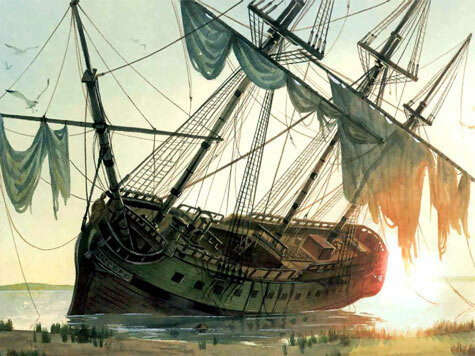 In 1717, he commandeered a French slave ship and renamed it the Queen Anne’s Revenge. With that as his flagship, Blackbeard struck fear into merchants from Virginia to the Caribbean, commanding over 300 men and three other ships at his height. Of course, that heyday was short-lived, as he was dead by 1718, and he lost his flagship months before he died. His reign as the world’s most fearsome pirate lasted just under twelve months, but it was still more than enough to burn his name into human history. Now archaeologists working for North Carolina’s Department of Cultural Resources are hard at work on a shipwreck believed to be that of the Queen Anne’s Revenge. While their current priority is to raise the ship’s anchor, they’ve also discovered three clusters of metal parts nearby on the seabed. These pieces provide new insight into just what weaponry Blackbeard used to force merchant ships into surrendering. “The three conglomerates consist mostly of lead shot, nails, and glass which we suspect were put in canvas bags and fired from the cannons. In the end, we were not able to recover these items during the expedition. They likely will be recovered this coming fall when we return to the site. There are 24 cannons within the wreckage and five have been cleaned. Four cannons were loaded and one had three 9-inch bolts, in front of the cannon ball, which would have been very terrorizing when shot. As with all pirates, Blackbeard did not want to sink merchant ships but scare them into giving up. Shooting bolts and scrap lead, iron and glass would have been very effective. Perhaps the scariest weapon was a hellish melding of two cannonballs, which Blackbeard had linked together using an iron chain. When fired together, the cannonballs would spin through the air towards the opposing ship’s rigging, striking more terror into any sailors that had crossed Blackbeard’s path. He also would take similar scrap iron mixtures and place them in bottles, creating short-range explosives. In his way, Blackbeard was a student of the classics, if perhaps unwittingly. All these terror techniques can be found in the military strategies of ancient armies from ancient India to the Phoenicians. Even more remarkably, Blackbeard’s grenades closely recall Leonardo da Vinci’s design for cluster bombs, which would similarly encase lots of sharp objects inside a case that, when fired, would be more deadly than any single cannonball. So then, at least in this one respect, Blackbeard and Leonardo were on an equal footing. I only hope that further investigation of the Queen Anne’s Revenge will reveal Blackbeard’s very own Mona Lisa. If you thought Leonardo’s subject had a bemused look, just imagine what a person would look like while being painted by history’s most gleefully psychotic pirate.